Hesitant to see patients < 1 kg? Join VETgirl for a 30-minute, case-based, Real-Life Rounds where Dr. Copper Aitken-Palmer, DVM, PhD, DACZM, will provide tips that will help you feel more comfortable handling, triaging, diagnosing and treating reptiles, small mammals and birds. Get the top quick tips on how to provide initial life saving care for these small pets. If you’re logged in and an ELITE member, it’ll be the BLUE BUTTON that says REGISTER HERE. Otherwise, if you want to pay to view it, you can purchase it alone (right side of the screen). Thanks! What is the cost for non-members? VETgirl Real-Life-Rounds are available to VETgirl members only. Are VETgirl Real-Life-Rounds available for viewing (without CE credit) for people with a trial membership? 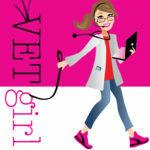 VETgirl Real-Life-Rounds are available for VETgirl ELITE members only.